In 2008 I was really beginning to dig into all kinds of films, exploring more of the independent material that was coming to light than ever before. I remember 2008 mainly for the remarkable summer at the theater that it was, but I also find it easy to recall a small film from a pair of brothers that was making waves. It was a little film called The Square that was co-written by a guy named Joel Edgerton and directed by his brother Nash. As far as I'd heard, it was a solid contemporary example of film noir and concerned itself with betrayal, revenge and cheating couples. It was a film that I felt somewhat more interesting for checking out simply because I was willing to go out on a limb and see what this buzzed about Australian production had to offer and indeed it was a well-executed thriller. I came to recognize Joel for his work over the next few years in Animal Kingdom and what could be considered his break-out American film in Warrior that led the way to him starring in more major Hollywood productions. It seems after building some solid ground beneath him in the industry though, Edgerton has returned to the thriller genre to write and direct for the first time. 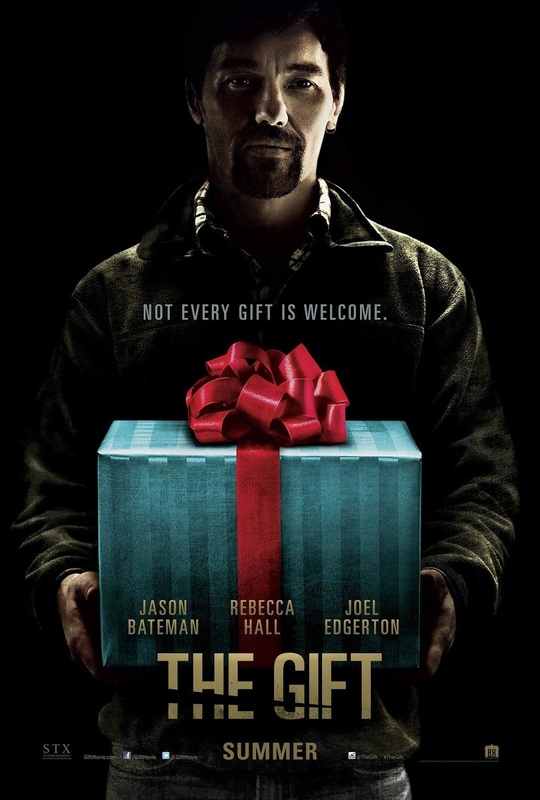 With The Gift, Edgerton has delivered a tense and slow-boiling psychological drama that stems from a thesis of how an idea can take hold of a person and tear them down. From the moment we meet Edgerton's Gordon Mosley we can sense that there is something slightly off about the guy, but having Edgerton play his own creation lends the perfect tone to what could have otherwise been an over-the-top showing that would lessen the effect of the final act in the film. That is all to say this product feels like the result of a singular vision, a focused and finely tuned story with specific characters and even more labored over depictions that come to show the audience how both credibly and expertly such genre pieces can be pulled off with the right amount of skill and vision. Edgerton feels at the top of his game here and with this technically being his feature directorial debut, I can't wait to see what he does next. Gordon Mosley (Joel Edgerton) is surprised to see Simon Callum (Jason Bateman) who he knew in high school. 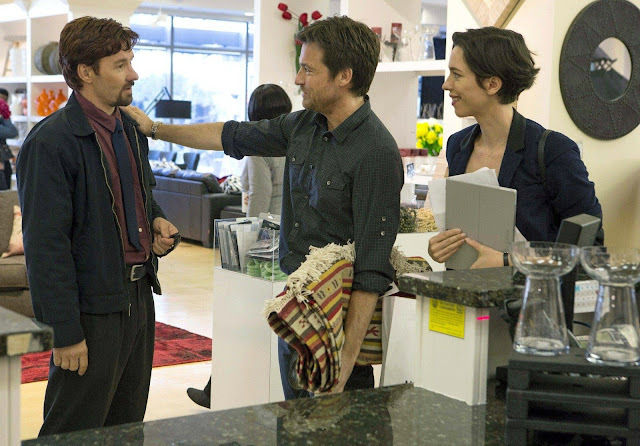 We first meet Simon (Jason Bateman) and Robyn (Rebecca Hall) as they are looking at new houses to buy and quickly move in to. They are from Chicago, but have relocated to California due largely to Simon scoring a job at an up and coming security company. There are also hints of Robyn's past that include depression and popping pills that make their move feel like a much needed new beginning. The couple move into a nice neighborhood with a home that is pleasant without being lavish. It features an architecture style where the living room is largely made up of windows and thus the perfect opportunity for Gordon to make his random visits all the creepier. Simon and Robyn run into Gordon while out shopping for amenities for their new home. It is somewhat strange that Simon doesn't recognize Gordon as the kid he knew from high school, only eliciting a curiosity for how much Gordon might have changed over the years, but also how and why, given what comes to light further down the road, Simon is able to act so normal in response to him. Given that Simon responds so openly though, he clearly gives the impression to Gordon that whatever happened in the past between them is dead and buried. In light of this pleasant reciprocation to his approach, Gordon begins to try harder to formulate a relationship with Simon and Robyn. Dropping by what I assume to be several times over the next several weeks to see Simon (or so he says) Gordon gets to know Robyn all the more as she is too nice to turn him away. In truth, Gordon seems to be picking up on her weaknesses, learning the couple's schedule and digging to see if people truly can change. By the half hour mark we are just beginning to see glimpses of the manipulation at play from Gordon's end. An hour in we reach a breaking point between the two men where more questions are produced leaving the last forty minutes to spiral out of control. 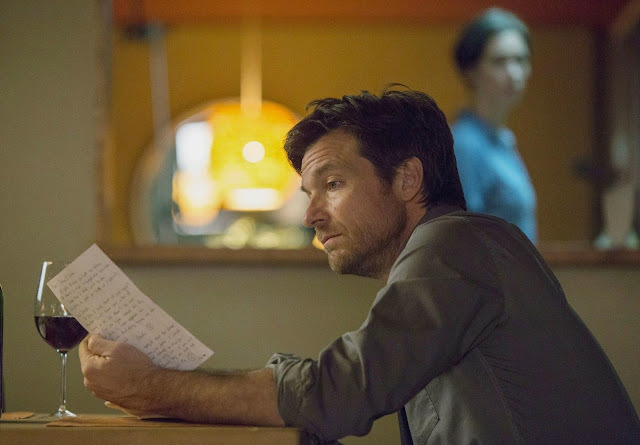 As Edgerton's script pulls back the layers of both Gordon and Simon more of what happened between them in the past comes to light and Robyn is forced to question how well she really knows her husband. Everything about Edgerton's Gordon is vague. When we talk about performances in films we typically concern ourselves with the leads, but ever so often the supporting character becomes the more fascinating aspect and thus is the case of Edgerton's performance here. Not only does Gordon present himself as something of an enigma, but his appearance suggests layers upon layers of trying to disguise who he really is. I couldn't tell if we were supposed to think Gordon simply had dark eyes or if we were supposed to take away that he was wearing contacts, but Edgerton clearly is and it makes his beady stares all the more menacing. On top of this he wears earrings as if trying to be cool without really knowing what trends to follow or trust. It also seems obvious that Gordon has changed the color of his hair multiple times. It's as if he's trying to take on this persona of a typical, masculine male that people initially find appealing due solely to appearance so as to mask the awkwardness that inherently inhabits his conversation abilities. This all proves effective when we begin to understand Gordon's motivations and his frame of mind. As The Gift is more about the results of poisoning others minds with ideas, what we're watching the whole time, whether we realize it or not, is the rebuilding of what Simon once tore down and the ramifications of these actions as we come to see Simon might not be the stand-up, average dude that he likes to present himself as. As Simon, Bateman is playing on a level we haven't quite seen him before. Everyone is accustomed to the Arrested Development actor more or less playing the same, laid-back but cruelly sarcastic suburbanite in every role, but here it is necessary he have a little more edge to him. What works so well about Bateman's slow-burn performance is that it escalates precisely on scale with the unveiling of his past and the unraveling of his current life. Between these two opposing forces is Hall's Robyn who is a fractured spirit trying to mend herself. As if being able to trust her husband less and less wasn't bad enough she develops something of a compassion for Gordon despite Simon's clear distaste for him being a part of their lives. Robyn (Rebecca Hall) suspects Simon knows more than he lets on about his old friend. For much of the methodically paced first hour I couldn't help but to think that this was going nowhere but the expected corner it seemed to be painting itself into. I was disappointed as I was rooting for the film despite the trailers looking rather generic and silly. "Gordo the Weirdo"...really? It felt like one of those late summer releases that was dropped in the doldrums of August against last-ditch summer blockbusters to be intended as alternative programming, but that not much was actually expected of. Instead, The Gift is a solid genre exercise that gave me two legitimate scares and another moment near the end of the film where I literally put a hand to my head at the realization of what was taking place. It's not often one has those kinds of experiences in a movie anymore, especially considering how many movies I see a year, but this one got me and I was so thrilled that it did. Edgerton, who may or may not have really defined his own directorial style yet, is more finely tuned in creating an atmosphere. With this film we can feel the claustrophobic sets and the confined worlds these people live in. Only two or three times do we step outside of a house to get a breathe of fresh air in Simon's corporate America office or to a local store that seem to be as much a relief to the characters as they are for the audience; a coming up for air if you will from the bogged down responsibilities of life waiting for us back at the house. The barely lived-in atmosphere of Simon and Robyn's house lacks the comforting ease of a home and feels all the more cold for it. Edgerton uses these environmental influences to cue what he prefers to emphasize in each of the characters and what they bring to the storyline. With his rather subtle writing style that helped make The Rover one of my favorite films of last year, Edgerton takes his time in the first two acts to pull off a culmination of all the layers he's put into play. This naturally works in the films favor as it allows the film to be able to creep up on the audience so that when the climactic moment finally does arrive where everything comes together it is completely earned.